This recipes is one of those moments where I just wanted to try something different. I was craving stuffed mushrooms, junk food, and bacon! Well, bacon is sort of an ever present craving really. Fortunately, this recipe was also one those moments where trying something new paid off! Unfortunately, I have no pictures of the product as this was made before I started the blog. 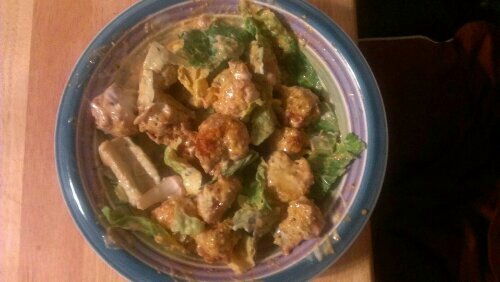 I haven’t made it again because my boyfriend had two new people, and this was a really a dish for two or an appetizer. When I make this again, I will be sure to add a photo. Let cream cheese come to room temperature. Remove the mushroom stem from the cap. Place all mushroom caps in a pan. Chop all mushroom stems. Put all the ingredients including the mushroom stems but the panko bread crumbs in a bowl and mix thoroughly. Fill the caps with the mix. Sprinkle the panko bread crumbs on the filled mushroom caps. Bake at 375° for 17-20 minutes. • The filling makes a really great dip, so don’t waste the excess, eat it with some tortillas chips. We did! • I removed all the seeds from the jalapeño before adding it. This really prevented the filling from being too spicy to be enjoyable. 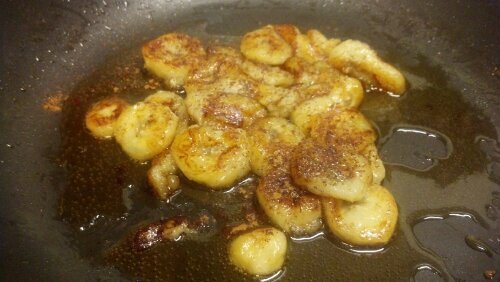 • When I made it, I also added the panko into the filling mix, but it isn’t necessary. That extra step did not bring much to the table. As I have examined before, I am not one to eat the same foods over and over. I can’t even do it with my favorite foods. However, I generally don’t cook in small portions. Again this does involve a crock pot. We’re kinda lazy, and whatever I cook in the crock pot stays in until we eat all the leftovers or freeze them. This I just put the crock pot with leftovers back in the heater and cooked this meal. Combine all ingredients in the crockpot. Cook on low for 8 hours, stirring occasionally. If you used the previous red bean recipe to make your beans then your chili should not require too much additional seasoning. The hot sausage in this recipe can be replaced with another type of ground sausage or more ground beef. I like my chili with Frito chips and cheese. Others serve it with cornbread or crackers! Yes, I know that I do a lot of crock pot cooking. I am busy girl, and I do love to cook. However, I also have limited time. Red beans on a stove take time, and so does the crock pot. Both take planning and prep work. On the other hand, I don’t have to hover over the crock pot like I would over the stove. This isn’t necessarily a new recipe, but it is the way I do my beans. My next post will show you how to turn the leftovers from this recipe into a pot of chili, so there is a method to my madness. Put dry beans, onion, garlic, and bell pepper in the crock pot. Fill crock pot with water to about an inch above the red beans. Sprinkle garlic powder, onion powder, salt, pepper, tony’s, worcestershire sauce, oregano, thyme, smoked paprika and sriracha over the whole pot, stir. Add bay leaves. Cover and let your beans soak overnight with all those delicious flavors. The next morning add the chicken broth, ham bouillon with 8 oz of water, and meat. You are also welcome to add additional seasonings before cooking thoroughly. Cook on low for 8 hours. Serve over rice. -Many people put celery in their beans. I am not a huge fan, but if you want it, then add the celery when you add the other veggies to the pot. – If you find the beans are too watery when done then add gumbo file to the pot and let sit on warm, it will thicken before serving. Also, you can mash a few of the soft beans with a fork it will thicken the dish too. – It’s even a great idea for leftover smoked meat and ribs that you’re tired of eat alone. Toss that leftover meat into the bottom of the pot before you cook on low, and it’ll come apart in your beans. Just pick the bones out before you eat. 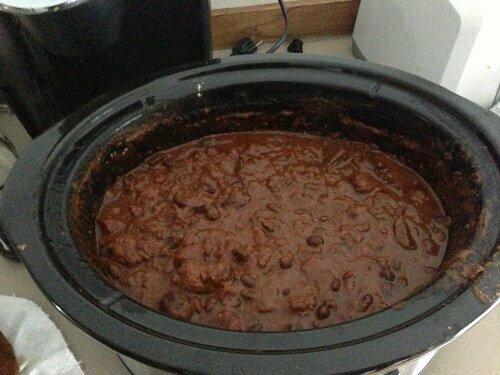 Next post I want to show you how to make these leftovers into chili! Shrimp Leftovers: what to do? So on this blog I’d like to share with ya’ll how we reinvented our shrimp remoulade and BBQ shrimp leftovers. I explain to others that I am A.D.D. with food. I can’t eat at the restaurant or fast food place in the same week much less the month. I have a hard time eating leftovers and particularly if those leftovers last for days. Typically, this food would go bad until I had an epiphany! My mom and I started wondering what we could make out of what was present or freezing half and using it later to eat or add to a dish. So I’d like to share our ideas for these leftovers. First off the remoulade sauce, we ate it originally the traditional way, boiled shrimp and lettuce. 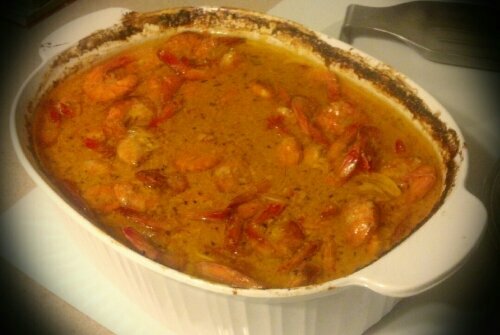 My mom also ate it with a creole tomato and some of the boiled shrimp. She said it was delicious, but I am not a fan of tomatoes. For lunch one day I mixed the remoulade with a can of tuna. I just ate it with crackers. It was very flavorful version of tuna salad. Another night after we received more shrimp, mom fried some, tossed over lettuce with remoulade. There are a few more ideas I have in mind but have not tried. I think remoulade would make a great pasta salad base or in a tomato cucumber salad. It work in almost any dish which calls for an alternative to just plain mayo, sandwiches, potato salad, etc. I even thinking it may work well with an Alfredo sauce. 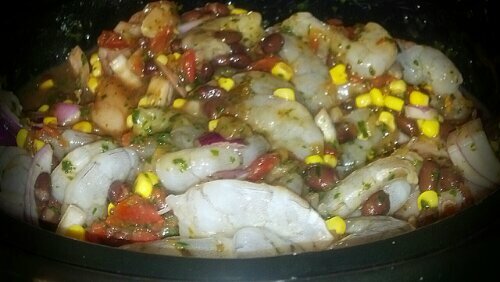 We also did a few different meals with the BBQ shrimp. Mom made BBQ shrimp quesadillas! 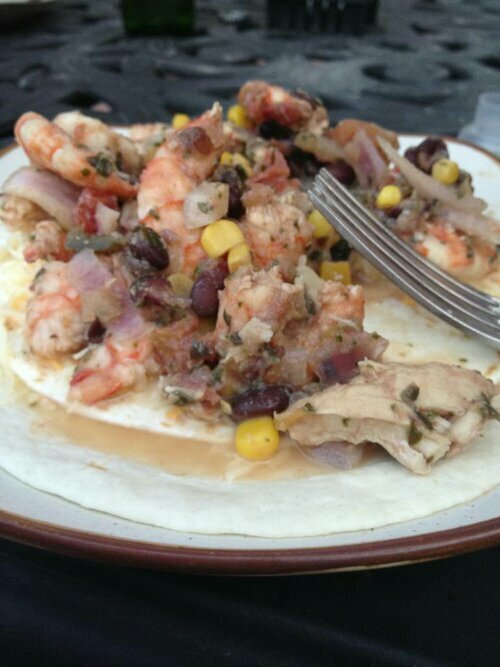 She peeled the shrimp, put them on tortillas, added cheese, and a bit of remoulade and BBQ shrimp sauce. We ate it all and dipped them in remoulade too! We also used the BBQ shrimp for breakfast. Scrambled some eggs, cheese, tortilla, and shrimp. Mom did the same for some the fried shrimp she made: scrambled eggs, cheese, tortilla, with remoulade. There are tons of options for your leftovers! Don’t limit yourself! My mom makes the best BBQ shrimp. Yes, it is even better than Pascal Manale’s. Yea, I have had both. The best thing about this recipe is that it is super easy! Add all ingredients into a Tupperware dish except the butter. Marinate for 2 days in refrigerator. If possible shake and flip over every 12 hours. Preheat over to 350°. Before baking add the two sticks of butter to the mixture. Bake for 35-40 minutes in covered pan. Stir every 15 minutes. Serve with french bread!